All lines in the image file are cut by the laser. Make sure that the lines are closed and have a solid line thickness. 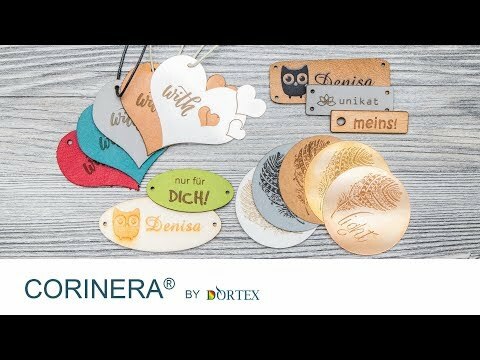 With Corinera labels, we offer you something that no-one else can: unique, laser-engraved labels made from leather, artificial leather, wood, SnapPap or metal. We will burn your design with computer-controlled precision into labels or hangtags made from exclusive materials with a unique recognition value. Almost everything is possible. You can choose from our shapes or upload any(!) desired shape as a file. The contours of your labels are cut with the laser, the images are engraved with the laser. Mounting holes are directly lasered; hole size for labels 1.5mm, for hangtags 3.5mm. Think outside the box and give your product an unusual eye-catching label! The selected accessories will each be added in appropriate quantity. Hinged rings are NOT suitable as key rings! The snap lock opens quite easily, espacially when the ring is loaded laterally or jerkily. You upload an image file containing the desired contours and possibly desired inner holes. The leather for our Corinera labels is an unadulterated natural product "Made in Germany". It is obtained only from young German steers and is tanned using plants and minerals. It is approximately 1.2mm in thickness and suitable for high-quality finishing of products that do not need to be washed, e.g. bags, or key ring tags. More about the properties and care of our leather labels can be found in the FAQs. The vegan alternative to real leather: high-quality artificial leather, as used for our Corinera labels. This is made from 100% polyurethane and is guaranteed free from hazardous substances. With a thickness of 0.8 - 1.0mm and a very authentic surface structure it looks very similar to real leather. It is also washable and durable and therefore good for finishing garments. More about the properties and care of our artificial leather labels can be found in the FAQs. Our 3mm thick, poplar wood is free of hazardous substances and ideal for use with products that do not need to be washed. Labels made from this material are, thanks to the minor production-related burn details, high of quality yet with a rustic element. Perfect for very special handmade products or for clever tags on gifts. More about the properties and care of our wooden labels can be found in the FAQs. Our beech labels and hangtags are made of beech wood in 2mm thickness. The five-fold layering makes the labels and tags dimensionally stable. Due to its durability they are suitable for many purposes, especially indoors and for products that do not need to be washed. Like all our Corinera labels, you can simply add our motifs and fonts to our beech labels, or upload your own logo and/or your custom shape. Sustainable and animal-friendly: SnapPap is THE new trend product for the DIY sector. This "vegan leather" is made from recycled paper and latex. After a few washes, it takes on a leather-like structure with an attractive vintage look. But even when unwashed, it has a high-quality look and makes handmade products especially eye-catching. With a thickness of 0.55mm the material can easily be sewn or attached, by hand or machine, to all of your handmade products. More about the properties and care of our SnapPap labels can be found in the FAQs. Our metal labels and hangtags are made of stainless steel in 2 variants, brass or bronze. All materials can be very widely used due to its durability, e.g. for individual name tags inside and outside or key chains. Homemade accessories or clothing are finished with metal labels. Like all our Corinera labels, you can simply add our motifs and fonts to our metal labels, or upload your own logo and/or your custom shape. More about the properties and care of our metal labels can be found in the FAQs. They show what it's about, who owns it or who is it: individual signs made of beautiful materials. Order the accessories right away at the same time.